It's up to HR to ensure that hiring, discipline, and termination practices are compliant with the law. Otherwise, you could put your company at risk of incurring costly fines, penalties, and employee lawsuits. This live one hour webcast will review the 2011 dockets of HR related cases, discussing specific findings and how they relate to day-to-day business operations. This webcast has been approved for 1.00 (General) recertification credit hours toward PHR, SPHR, and GPHR recertification through the HR Certification Institute. Please click here to register or call CMS at 800-517-9099. This webcast will review the 2011 dockets for HR related court cases. A brief background of each case will be presented along with the outcome and discussion of the specific implications on the administration within the Human Resources function. Focus will be on federal court findings, although specific state findings that are relevant to HR, setting precedence for future findings, will be covered. Which U.S. Supreme court rulings affect human resources and what you should be doing to protect your company. Which state case rulings are setting precedence for future rulings that might affect your business. Which cases will be ruled upon in early 2012, so employers and HR departments can be vigilant in following cases specific to their business practices. Attendees should include Human Resource Managers and business professionals in the U.S. who desire to become more knowledgeable in how business will be affected by legal decisions passed on during 2011. This webcast has been approved for 1.00 (General) recertification credit hours toward PHR, SPHR, and GPHR recertification through the HR Certification Institute (www.hrci.org). Certificates of completion will be provided upon request only to individually registered attendees. Attendance for the full webcast hour is required to receive recertification credits (partial credits cannot be provided). Groups of people participating in the webcast together must be registered and attend the webcast individually to receive certificates. Certificates will be sent via email to registered attendees in PDF form within 30 days of validated attendance. If you have additional questions, please email us at es_training@sage.com. With over 30 years' experience in the HR field, Mary Anne is well prepared to help businesses find solutions to their most troubling HR-related dilemmas. Her HR experiences have elevated her from HR Representative to the VP level in a multi-state healthcare industry leader before beginning her own consulting business. Along the way she spent time honing her skills in Employee Relations, Staffing, EEOC, Organizational Development, Compensation and Training in the telecommunications, financial, automotive, higher education and healthcare industries. Beneficial information about SEO Companies. 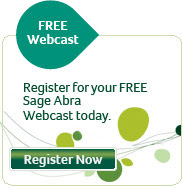 What's New in Sage HRMS 2012?